Heat the oven to 400ºF. Place the almonds on a rimmed baking sheet and toast them until lightly golden brown (about 15 minutes) and set aside. Prepare a separate baking sheet and brush it with almond oil or 1 teaspoon almond extract. If you have a Teflon baking mat, place it on the baking sheet and brush it with the almond oil. If you are using extract, first brush the sheet with butter. 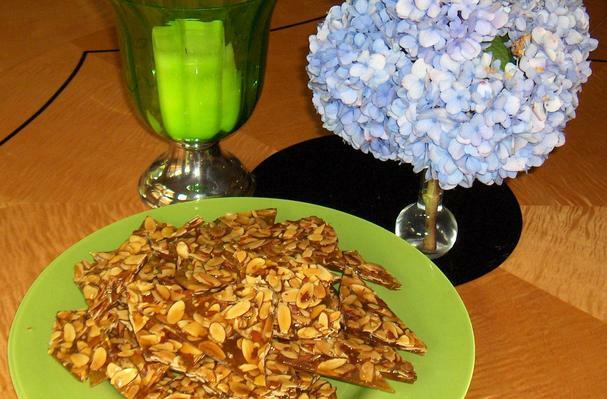 Immediately add the toasted almonds into the candy and stir quickly to coat them. They should be completely covered with the syrup. Work very fast at this point, as the candy will begin to cool and turn hard. Spread the brittle quickly to an even thickness in the pan. Let the almond brittle cool completely and then break it into pieces by dropping the sheet on the counter. At this point you can wrap each piece in cellophane wrapping paper or serve on a candy dish. Vendors along the streets of Bologna sell Brocante con Mandorle in large sheets. It can be made with toasted filberts also. In Italy they it is made with whole almonds and is very thick. It is very hard but delicious. I found that if you use sliced almonds it is a little thinner and a little easier to eat. The flavor is more intense with the whole almonds.